The Panasonic Lumix LX100 Mark II is a tale of two halves: it's a soft update to what is ultimately a belting high-end compact camera. By which we mean we love it, but its improvements are fairly subtle – especially considering the four year turnaround period since the original model. That's right: Panasonic has, for the first time in its history, named one of its Lumix cameras a "Mark II" model. Therefore you're not looking at the LX200, or some other obscure number of naming mechanism, rather the LX100 M2. The sequel to 2014's high-end compact, the LX100 Mark 2 takes the original model's form, adds a grip, a touchscreen, some additional modes and controls (such as 4K Photo/video) and, well, that's about it. Of course, being the LX model, the Mark II features a Micro Four Thirds sensor, which is massive by almost any compact camera sensor's standards. And as this sensor is the very same as found in the Lumix GX9 and paired with the fixed 24-75mm f/1.7-2.8 lens, it's quality is utmost. Is it the high-end compact to beat all others or just a subtle update to a classic? Any LX100 owner will take one look at the LX100 Mark 2 and struggle to see much difference. The footprint is the same, as is the lens and general layout, with only the front grip being a prominent new addition from a visual standpoint. There is a lot more going on behind the scenes though. The most prominent of which is the addition of a touchscreen for touch-based controls, which we felt was missing from the original model. Sadly there's no vari-angle screen bracket, which has felt restrictive in use – this feature is a staple in most dedicated cameras these days. Elsewhere there's Bluetooth and Wi-Fi connectivity to bring the camera up to date for rapid sharing between devices. Which, as we're using the new MacBook Air with no SD card slot, that's been an essential to share between devices (well, camera to phone to laptop). New effects, filters, 4K Photo (which you can read about here), monochrome and low-light/starlight autofocus also feature. All nice-to-haves, but generally subtle additions overall. The battery is also charged via USB, which although is a potentially good idea has a bit of a flaw: as no charging cradle is included for mains charging, there's no way to easily charge up a reserve battery, and USB-based charging is currently too slow in all cameras that we've seen (it should be USB-C with fast-charging, but it's not). That's the new stuff done and dusted, so just what is the LX100 Mark II like in use? We initially used it over the summer, then on a trip to Beijing, China, to furthehr extend use. The LX100 II is certainly crammed with plenty of top-spec features. Its style is very much all hands on deck, by including physical aperture, shutter speed and exposure compensation dials. There's no ISO dial, which is instead controlled from within the menu settings. he exposure compensation dial is really handy to get that precise exposure, although it doesn't lock which can see it mis-set when pulling the camera from a bag. If you want the camera to do everything automatically, then selecting the little red 'A' on each dial will set things to automatic (or aperture/shutter/ISO priority as you please) – although there's also an iA (intelligent auto) button tucked by the on/off switch, which we sometimes pressed by accident and wondered what was happening. As we said of the original LX100, the Mark 2 has a great lens on board. It's a 24-75mm equivalent, with a lens control ring for focus or zoom. The toggle around the shutter button can also be used to zoom, although we find it rather slow to progress from wide-angle to maximum tele (a criticism of the original, which we're surprised hasn't been fixed this time around). The position of the aspect ratio switch – which can toggle between 3:2, 16:9, 1:1 and 4:3 – is still too tight to the camera's body, which feels like a lost opportunity (we feel the Mark II should have a few more design nips and tucks overall, frankly). The lens also has fairly limited reach. In a world where mobile phones are offering genuine zoom lenses, our colleagues in Beijing were surprised to see us using what they described as a 'proper camera'. Of course the quality from the LX100 II is exponentially better than that of a phone, while if the lens offered any more zoom then, well, the camera would be far too big. Even as is stands the manual aperture ring is overridden if selecting anything greater than f/2.8 and zooming a little – the 75mm equivalent maxes out at f/2.8, not f/1.7. The LX100 II's screen is a solid implementions, although doesn't receive the boldest of upgrades. There is touchscreen control, which makes it simple to adjust the focus point and make feature selections, but having worn gloves in use there have been times when accidental point adjustment is made that's then difficult to move again. The biggest issue with the screen, however, is the lack of a vari-angle bracket, which, as we've said, feels restrictive – featuring this would have made the LX100 II all the more essential. The built-in viewfinder, meanwhile, is a large 0.38in (0.7x equiv. magnification here) LCD panel, which adds eye-level AF for rapid activation with autofocus ready to go. If a finder is essential then this one is reasonable, despite feeling a little small – which will depend on what you're used to using. Autofocus is every bit Panasonic: i.e. it's fast, there's a bundle of focus points, and lots of customisation available. From the full 49 points, to zones, 1 Area AF, or even Pinpoint (crosshair focus which zooms in to 100 per cent scale for precision focus), all bases are covered here – just as if this camera were a Lumix G-series interchangeable. That said, however, moving subjects are a little trickier to capture, while the slow zoom speed has scuppered our snapping attempts a number of times. Having wandered the streets of east London and the temple grounds of Beijing to snap away at various opportunities, we've been able to explore the LX100 II's multi-aspect sensor. 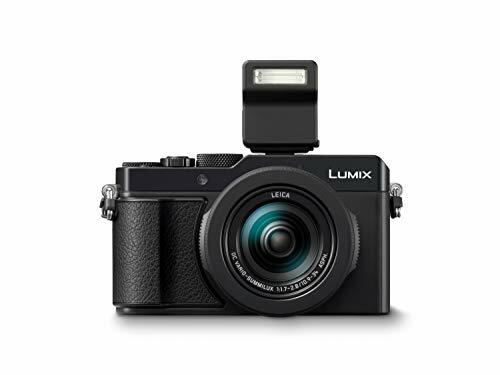 This is a rarity for Panasonic: the company introduced one in the Lumix G2 (many moons ago, which then disappeared for its follow-up), while the LX100 brings back this much-admired feature. The idea is simple enough: the sensor is oversized, able to deliver a constant diagonal field of view at all its aspect ratios, without the auto cropping that you often see in other cameras (especially with 4K video mode in most competitors). The real sell from this sensor is its Micro Four Thirds scale. This might be 'oversized' depending on the aspect ratio that you pick, but relative to the lens there's always good sharpness. Having cherry-picked the sensor from the Lumix GX9 also brings results right up to speed for a 2018 market, outdoing the original LX100 by a whisker. The majority of our shots were taken at the minimum ISO 200 (there's still no ISO 100! ), presenting natural colours, ample detail, and well-considered exposures throughout. A major part of a camera such as this is the aperture control: with f/1.7 selected (as we've said: it won't remain active beyond 24mm and the camera will only warn you this by displaying settings in red, but it won't stop shooting, instead stopping down automatically) there's a huge amount of background blur at your fingertips. That's the great thing about a larger aperture (which, incidentally, is constructed of nine blades for softer, more rounded bokeh) combined with a large sensor. Beyond the lower ISO sensitivities, the LX100 Mark II continues to cope well. Shooting ISO 800 we were able to capture colourful graffiti on brickwork. Upping the settings to ISO 1600, where we shot bright lanters against the dark sky, the result is still clear – despite some slight image noise visible in certain darker tonal areas. While some large sensor compact cameras have terrible close-up focus possibilities, the Lumix LX100 Mark2 copes incredible well, offering up to 3cm-from-lens focus (when shooting at the wide-angle 24mm setting). There's a specific Macro AF switch to the side of the lens which allows this focusing to occur without issue, meaning we could capture the detail of a garlic clove or ornamental engravingn extremely close, presenting each with ample detail. Keeping the aperture a little stopped-down ought to help yet more with the detail. Another major new feature (well, new for this camera anyway, not Lumix in general) is the addition of 4K Photo. This mode can capture 4K resolution at 30 frames per second in a variety of ways: press-and-hold for capture; press to start/stop capture; or select pre-burst which captures a two second capture before you've even pressed the shutter (to not miss a moment). There are some fun features in 4K Photo, like compositing multiple exposures, layering frames for post focus adjustment (for shots on a tripod/from a fixed camera), or single frame selection and extraction. Despite 4K's benefits, however, it's not a visible mode on the camera itself (by default it's on the Fn button). Once activated it's far too easy to forget it's on, which is irksome. And the more advanced adjustments it offers are a little too deeply buried within the menus to be of immediate and therefore obvious use. In short: for a camera like the LX100 II, 4K Photo's implementation means it feels too buried to be as big a feature as billed. It's not necessarily an out-and-out reason to buy the camera, but, again, falls on the nice-to-haves list. Yes, we've got added toucshcreen, which is great. But where's the tilt-angle LCD screen? Is USB charging a true step forward? Are some additional shooting modes and filters all enough? Ultimately, existing LX100 users may not see a heap of reasons to upgrade their current camera to the newer generation. Newcomers, however, can rest assured that the LX100 Mark 2 represents one of the finer high-end compact cameras money can buy. The sensor is large, the lens is excellent and the performance typically decent. At £849 it's not back-pocket change by any means, but that certainly sets the LX100 II in good stead against the Sony RX100 and Canon G1 X MkIII. Whether that's enough for it to make an impact in 2018, in today's smartpone dominated world, is another matter. The RX100 doesn't have a sensor that's quite as large, but the 1-inch one on board is still fantastic. This camera really wins out in terms of scale – it's far more pocketable than the Panasonic, which gives it great appeal. No surprise it's often touted as the best compact camera money can buy (but you'll need a lot of money to bag one!). For some years Canon lacked a competitor that was small scale enough to really rival, but the G1 X III finally achieves that accolade. Its quality is great, but the price is far higher than the Panasonic, which acts as a natural restriction. Still, it does offer a vari-angle LCD screen for more creative control.